One of the top causes of disabling workplace injuries involves being caught in or compressed by something, according to the 2011 Liberty Mutual Workplace Safety Index. When any body part is caught or compressed, this can crush the affected part of the body, causing serious or even deadly injuries. If you or a loved one has suffered a crush injury on the job, you could be eligible for benefits through the Georgia workers’ compensation system. An experienced Atlanta personal injury lawyer at Parsons & Associates, P.C., can help you understand your rights and assist you in making a claim. Being hit by a falling object, such as something falling off of scaffolding. Being pinned between two things, such as a piece of metal and a building or two vehicles. Structures collapsing, such as a building on a construction site. Being run over by equipment or machinery. Getting limbs caught in machinery. Machinery or equipment tipping over. Crushing injuries and amputation as the result of a crush injury can occur in any field and in any industry. 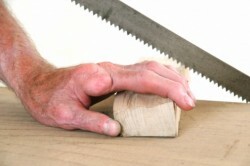 However, the U.S. Department of Labor indicates that around half of all amputation injuries occur in the manufacturing field. When any of your body parts are crushed or caught, muscle cells can begin to die almost immediately. Lysis – This refers to the immediate disruption of the cells that occurs as a result of a body part being crushed. Ischemia – The pressure that is put on muscle cells as a result of a crushing injury causes the cells to become ischemic. This causes them to start generating large amounts of lactic acid. The membranes of the cells then start to leak. This can occur within the first hour after the crushing injury. Vascular compromise – Crushing injuries can also cause large vessels to become compressed. This can cut off blood supply to the muscles and tissues, leading to cell death. Damage to the skin tissue. A limb being severed immediately. A limb needing to be amputated surgically. Broken bones, including a broken spine that leads to paralysis. The extent of the crush injury depends on the body part that is affected, the force of the crush and the length of time before the injured person is freed from the situation causing the crushing injury. Body parts that are frequently affected by crushing injuries in the workplace include fingers, hands, feet, legs and arms. However, any body part can be crushed if it is caught or compressed by something. A crush injury may be much worse than it initially appears to be because the cell disruption can continue to result in the death of muscle cells even after the victim is freed. Cell death can affect not only the part of the body that was trapped, but can also release toxins throughout the body, affecting overall health. When an amputation injury occurs, additional complications can also include infection, blood clots, phantom pain, swelling, improper healing necessitating further amputation and cardiac problems. Post-traumatic stress disorder, anxiety and depression are also common after a person has suffered a crush injury, especially if the injury led to an amputation. Eligibility for workers’ comp benefits does not depend on whether your employer was negligent in causing your crush injury. People who suffer an injury at work are usually required to obtain benefits through workers’ compensation, as it is rarely possible to sue an employer over a workplace accident. However, there may be certain circumstances in which a third party was responsible for the crush injury. In these situations, a personal injury claim for additional damages could be filed against the non-employer third party who caused your accident. At Parsons & Associates, P.C., ourAtlanta workplace injury lawyers understand how disabling a crush injury can be. We will work to make sure your medical bills are paid and that you have the income you need to support yourself and your family. To learn more about how our Atlanta work accident lawyers can assist you with your workers’ compensation claim, contact us today at 770-422-9000, or fill out our online contact form for a free and confidential claim review. We return calls within 24 hours from our offices in Atlanta and Savannah.